A lot of people go to Walt Disney World with their minds set on meeting a certain few characters, and these are the characters that will consistently have the longest waiting times. However, maybe you and your child(ren) aren't interested in meeting Mickey Mouse, or you weren't able to score that coveted Anna and Elsa FastPass and the standby line for Princess Fairytale Hall has reached all the way outside the building. Fear not! There are plenty of character experiences to enjoy with typically lower wait times and they can be just as magical, if not more so! 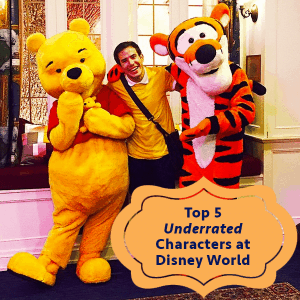 Here's my list of my favorite character experiences that often go overlooked in the parks. This spritely spirit meets daily behind the Cinderella Castle at Magic Kingdom (currently by the New Fantasyland walls during construction.) She gives AMAZING hugs and is an absolute joy to converse with! Her line also serves as the line to meet the Tremaine family, as they alternate meeting times through the morning/mid afternoon, so check with her character attendant friend before you get in line so you know whether to stay that moment or come back in 15-20 minutes. The moment you enter the Magic a Kingdom and walk into Main Street USA you have the opportunity to be magically whisked away to a magical book with a little bit of faith, trust and pixie dust! Tinker Bell LOVES to talk and will gladly share all about her adventures in Neverland with you. You can be transported to her little meeting place by entering the Town Square Theater, and wait times are typically never over 30 minutes. It's always delightful to fly with her. These two are easy to miss because their meet and greet area is tucked away by the Splash Mountain exit near the Frontierland Train Station in Magic Kingdom. It's an absolute must for any Toy Story fan, as this is Jessie's only regular meet and greet area. In this pic, I told Jessie if she ran away with me, she'd never have to hear that sad, sad Sarah McLachlan song from Toy Story 2 ever again. While these two adorable friends have meeting places at both the Thotful Spot (next to the Winnie the Pooh ride) and Crystal Palace at Magic Kingdom, my absolute favorite spot to meet these two is in the United Kingdom pavilion at Epcot. Their meet and greet area is tucked away in the very back of the pavilion so you'd totally miss it if you didn't know it was there! It's designed to resemble Christopher Robin's bedroom, and meet times usually begin in the afternoon and go until early evening. Yes, I did dress up like Christopher Robin to go meet them. Don't judge me. What's better than getting to meet characters? Getting to dance in front of Cinderella Castle with them!! The Move It Shake It Dance and Play It street party kicks off at the start of Main Street USA and parks in front of the Castle 2-3 times daily. It's an opportunity to get silly with character friends and dance your tail off if you choose to do so! Characters in the street party that come to dance with guests may include Baloo, King Louie, Phineas and Ferb, Stitch, and the Genie, all in colorful party garb. The music is a lot of fun, you get to help choose the song played at the end, and if you take a selfie and upload it to your Instagram with the hashtag #MoveItShakeItPics, you might just get featured on one of the float's big screens! Baloo hugs are my absolute favorite. Don't tell any of the other characters I said that. I want to meet the evil characters, evil queen, Maleficent, hook, Jafar, Cruella Deville, Cinderella’s mom and step sisters….. These are great ideas. I will be sure to check out Tinker Bell with my daughter at next visit. Thanks Dustin! 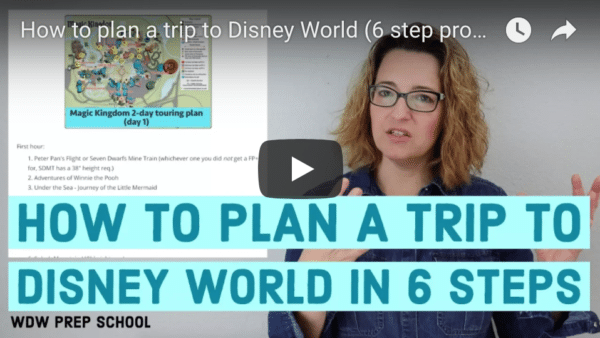 I need a new Disney Prep School blog post!! They’re so helpful! Great post! Any tips for how to interact with the characters? I never know what to say and just kinda stand there with a silly smile on my face.